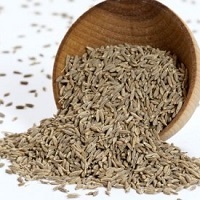 Cumin seeds are also known as Jeera in India. It is one of the important and frequently used ingredients for spicing the Indian food. It helps in digestion and is also used as a medicinal plant which has proven to treat common cold. The cumin plant grows to 30–50 cm and is reaped by hands.Cumin seeds have a distinctive flavour and aroma due to which they are widely used as a spice globally. Cumin seeds are usually adulterated with grass seeds covered with charcoal dust. To detect adulteration, rub the cumin seeds on palms. If palms turn black then adulteration has taken place.